Cooking has never been so quick and easy. Whether you’re a seasoned cook or a beginner, there are bound to be days when you’re simply not in the mood to make dinner. Rather than relying on takeout or delivery, try these simple recipes that feature the best shortcut ingredients from Trader Joe’s. Fan favorites ranging from riced cauliflower to pulled pork can be used to make fantastic dinners—and your kitchen experience will be far less stress inducing. Making your own pizza at home is always satisfying, and it’s really simple to do—especially when you aren’t making dough from scratch. Whether you want to use prepackaged dough or already rolled out crust, Trader Joe’s has both for you. Since you have your base ready, creating the perfect combination of toppings is the fun part. Making Thyme For Health shares a sundried tomato and pesto pizza using this store bought dough. The sliced zucchini and corn on top only makes this pie look even better! Once you start using Trader Joe’s boxed butternut squash soup, you won’t be able to stop. There are tons of hacks that you can try using this flavorful ingredient, but this one from Delish is so simple and tasty. All you have to do is heat the soup up while cooking some bacon in a separate pan. When your butternut squash soup is ready, add the bacon and some chives to complete the meal. Making pulled pork isn’t easy—but that’s where Trader Joe’s comes in. Their refrigerated pulled pork takes only minutes to heat up, and then you can satiate all of your cravings. Cup of Jo shares her favorite way of using this handy ingredient: tacos, of course. With some avocado, salsa, and tortillas, you’re all set for the feast you’ve been wanting. While on the topic of tacos, let’s take a minute to talk about the easiest fish tacos imaginable. Whether it’s for yourself, your friends, or a bunch of hungry kids, these are easy to put together and delicious. The trick? Use frozen fish sticks from Trader Joe’s. This quick dinner from Lauren’s Latest will please everyone. While the fish is cooking, put together your own salsa with things like beans, tomatoes, peppers, etc. Once your fish sticks are ready, lay them out on a tortilla, and top with your taco essentials. One of the most popular items from Trader Joe’s these days is the riced cauliflower. Adding stir fried veggies is an easy way to put together a quick dinner, but you can take it one step further. The Movement Menu shares a simple way to turn this into fried rice in a few steps. Cook the riced cauliflower in a pan along with a variety of spices, and your meal will be completely ready in a few short minutes. Add in eggs or your favorite type of meat to make this dish even more filling. Fully cooked sausage is one of the best things to have readily available in your kitchen. Aside from being an inexpensive ingredient, it’s also super easy to heat up and add to any meal. Luckily, Trader Joe’s has a great selection of sausage. This sausage and quinoa dish from Engineering in Style involves onions, carrots, and sausage. When that’s all heated up, add in the quinoa and chicken broth and simmer until the quinoa is fully cooked. This meal is easy and hearty and will definitely find its way into your weekly routine. Making your own Thai meal at home can be intimidating, but using ingredients like Trader Joe’s frozen brown rice will make it easier. This recipe shared by Design Love Fest will inspire you to get in the kitchen and whip up something tasty. 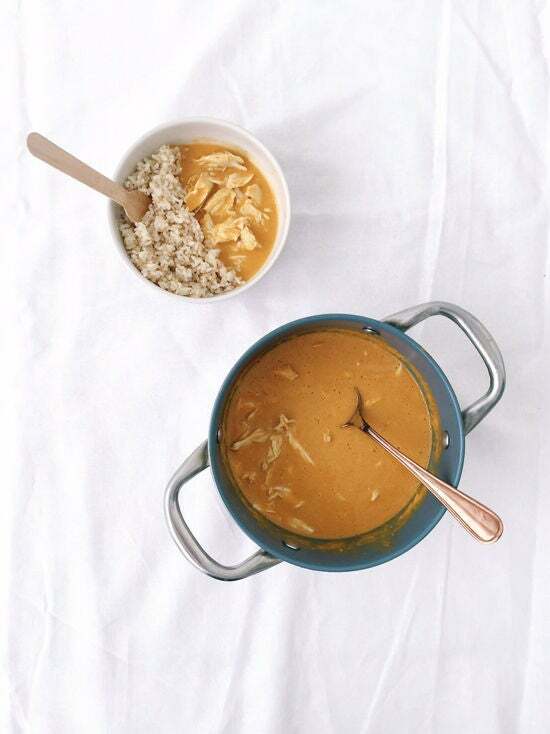 Aside from brown rice, you’ll simply need coconut milk, chicken, and red curry sauce. Once your chicken is done cooking in the the pan with the coconut milk and curry, serve it over the brown rice. One of the best things to pick up from Trader Joe’s is their broccoli slaw. This slaw can be used in just about any way imaginable, from salads to stir-frys. This breakfast option is a standout. You don’t always have time to sit down for a proper meal, but this broccoli slaw makes putting together a complete breakfast a whole lot easier. Add in some veggies like mushrooms or zucchini, put a poached egg on top, and you’ve got a delicious, healthy meal. All of these meals are super easy, but this one is surely the easiest. Grab some black beans and pico de gallo from Trader Joe’s, and your dinner is literally done. Heat up the black beans and pico de gallo together, and then puree it to make yourself a tex-mex soup. Throw on a dollop of sour cream, and enjoy. You can thank Mom’s Kitchen Handbook for this hack. Let’s not forget about dessert. Trader Joe’s speculoos cookie butter has been a favorite for years and years now. This dark chocolate speculoos truffle cake recipe from Cake Merchant will change your life. Layers of speculoos buttercream in between chocolate cake and chocolate frosting is the stuff of dessert dreams.